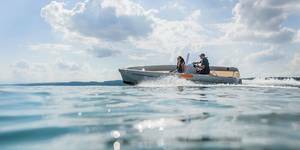 The German manufacturer of electric outboards Torqeedo provided the integrated propulsion system for the world's first electric-powered freefall lifeboat, which is being built by the Dutch builder Verhoef. The vessel recently passed its final drop tests, making it the first fully functional electric lifeboat in the world, said a press release from the company. The first of the new Verhoef aluminium 32-passenger lifeboats will be deployed on an offshore platform in the new Valhall Flank West oilfield project in Norway. The contract includes an option for similar lifeboats in the future. Verhoef and Torqeedo engineers have developed and tested a fully integrated emission-free propulsion system consisting of a 50 kW, 80 horsepower-equivalent, Deep Blue inboard electric motor powered by three 30.5 kWh Deep Blue batteries with technology by BMW i. The rugged system is designed to withstand the heavy g forces of freefall launch and provide 30 minutes at full speed, followed by 10 additional hours at 50 percent of maximum speed. The electric system also includes an inverter to drive a water spray pump, which is a requirement in case the craft drives through burning oil on the water's surface. One of the primary motivations behind the switch to electric power is to reduce the high maintenance costs of diesel engines currently in use, according to Verhoef. Experience has shown that diesel lifeboat engines require a great deal of ongoing maintenance and repairs. Soot accumulation in the seldom-run engines can cause internal damage and negatively affect the performance and reliability of the evacuation system. Electric propulsion also eliminates the need to transport, store and handle diesel fuel on the platform. Verhoef estimates that the electric propulsion system will reduce operating costs by about 90 to 95 percent compared to combustion-powered lifeboats. The built-in connectivity function will enable remote monitoring of the condition of the electric system from shore. The system also comes with a nine-year battery capacity warranty.